All-America Selections recently honored a horticulture luminary at their annual Awards Banquet, held this year at The Penthouse in beautifully reinvigorated downtown Rochester, New York. The banquet was a mid-event celebration where industry representatives, judges, breeders, growers, retailers and resellers gathered to visit All-America Selections Trial Grounds and Display Gardens. Tour stops included the Harris Seeds trial grounds and offices, Greentopia and Green Visions in Rochester, Bejo Seed trials in Canandaigua and Sonnenberg Gardens in Geneva, New York. The prestigious AAS Medallion of Honor is presented to an individual who has given a lifelong dedication to the advancement of horticulture. 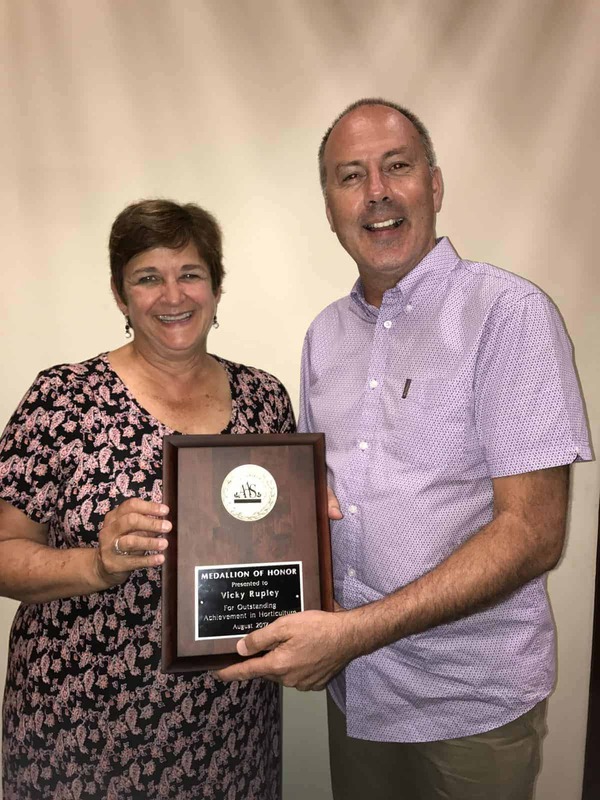 All-America Selections is pleased to announce that the 2017 Medallion of Honor recipient is Vicky Rupley of Harris Seeds in Rochester, New York. Vicky started her career by attending the University of Rhode Island, including a summer internship pollinating tomatoes at Harris Seeds. She then went on to UC Davis in California and received a Masters in Agriculture Education earing her credentials to teach and lecture on vegetable crops. In 1985 Vicky transitioned to the industry, working at Harris Moran Seed Company, Ball Seed, Sluis & Groot and Harris Seeds where today she serves as the company’s Executive Vice President. In addition to her professional career, Vicky has generously given of her time as a member of the National Garden Bureau Board of Directors from 1995-1998 then as a member of the All-America Selections Council of Judges beginning in 2006. While serving as a judge, Vicky then joined the AAS Board of Directors as a Director, Vice President, President, Past-President from 2007-2015. Fellow AAS Director Mark Gross from PanAmerican Seed, a long-time industry colleague, and friend of Ms. Rupley presented the Medallion award. All-America Selections proudly salutes an industry achiever who humbly does so much for the industry, including All-America Selections. Congratulations Vicky!